I love Greek Myth so I had a really high hope for this book since it's by Meg Cabot and it's about the retelling of Persephone and Hades. 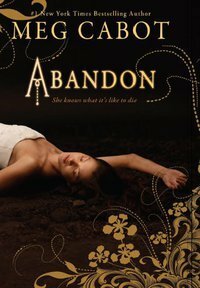 But sadly Abandon didn't meet my expectations, I was so disappointed. For some reasons I didn't feel like the story begins. I mean, I kept reading and had the feeling that all of this was just a preparation/ introduction for the real story. The romance is meh =(... I really don't know what to say since I felt nothing. Nothing at all. John declares his love for Pierce after meeting her JUST a few times---> oh how I hate insta-love because it's just so unrealistic =X Though sometimes I don't mind insta-love if I can feel the attraction or the pull. I don't know if I make sense here but what I wanted to say is that "show me the love but please don't tell." I want to feel it for myself you know. To make it even worse, I couldn't connect with the characters. I don't really know where it went wrong but whatever happens to Pierce I was like "so it happened, what else. Oh am I supposed to feel something here? What is it you want me to feel exactly?" I didn't like this book one bit. Why I didn't quit earlier? because stupid me, I kept hoping that it would get better. Abandon, oh how true because that's what I'll do now. On the second thought, I think I should pick up the second book since the ending is somewhat not that bad. Maybe it'll get better, I hope. Guess I should check it out from the library and if it does getting better then great. If not I just return it, no big deal. Yeah let's give it a second chance then. Thank you. Since it's the holiday season, I don't know when I can do it (with all the travels and family gathering) but I'll try to do it as soon as I can. Looks like a good book to win. Congratulations. Thank you for sharing it.